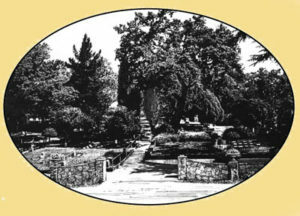 The Alamo Cemetery on El Portal at the boundary of Danville and Alamo is a public, nonprofit cemetery governed by three Trustees appointed by the Board of Supervisors. No ground burial sites are available except for existing family sites, although niches are available for cremated remains. The cemetery is part of the Alamo-Lafayette Cemetery District, an endowment fund district, with offices located at 3285 Mount Diablo Blvd. in Lafayette. For information contact Patricia A. Howard, Superintendent, at 925-284-1353 or email her at alcidst@pacbell.net . The Alamo Cemetery was established in the 1850s and includes burial plots of many San Ramon Valley pioneers. Some names important to early valley history include: Jones, Wood, Stone, Bollinger, Baldwin, Humburg, Boone, Cox, Young, Love, Close, Wiedemann and Hall. The first recorded burial (1856) was a six-year old girl, Callie Chrisman. This area was an important one in the early history of Alamo and Danville. The Cumberland Presbyterian Church was established in 1856 and located on the east side of today’s Danville Blvd., not far from the cemetery. The Union Academy, a large boarding high school which served the county from 1859-1868, was on the west side of Danville Blvd. Two plaques have been dedicated by the San Ramon Valley Historical Society in this area. One commemorates the first Spanish expedition through the valley and is located at the corner of El Portal and Danville Blvd. The other describes the Alamo Cemetery at the entrance to the cemetery. Trustees of the Alamo-Lafayette Cemetery District govern the Alamo Cemetery. Notice that the streets are named for trees and the paths are named for flowers, a practice established in the nineteenth century. Crepe myrtle trees are currently being planted. Everything in the cemetery is intended to provide a park-like atmosphere.